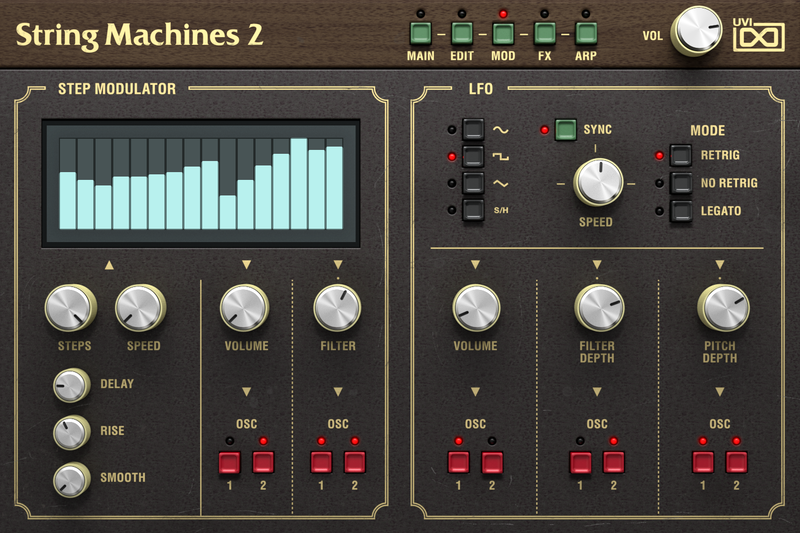 Over 60 string synthesizers spanning 50+ years of design innovation from around the globe have been carefully collected, restored and recorded to create one remarkable instrument: String Machines 2. 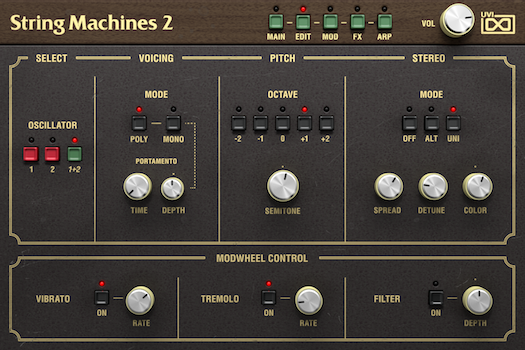 A multi-year effort, String Machines 2 greatly expands on the original, including many rare sounds and machines exclusive to this collection as well as a completely updated architecture and interface. 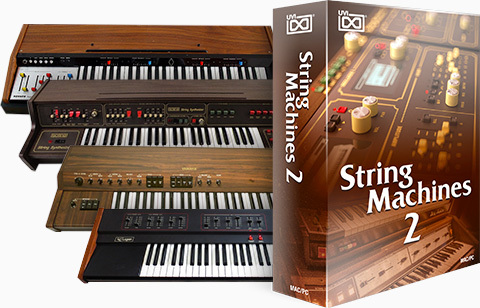 Now you can create stunning keys, pads, brass, bass, voices, piano sounds and more with the warm analog tones of vintage string synths. 355 hand-crafted presets have been designed to get you started, built on a foundation of 46,000 samples, while a versatile dual-layer architecture lets you easily combine the sounds of multiple machines together to create new hybrids with creative freedom. 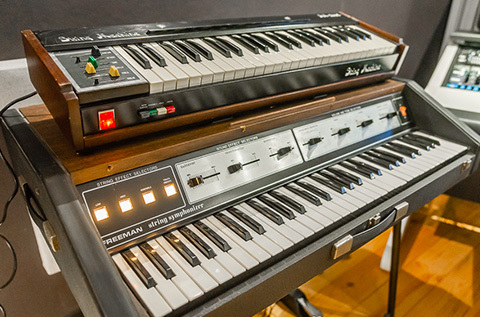 In the 1970s, commercial keyboard designers began an attempt to reproduce orchestral string sounds through analog synthesis. 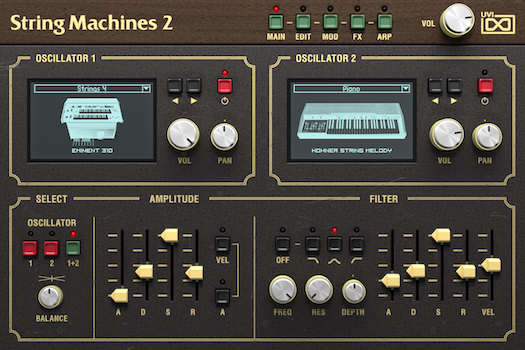 The results were far from their original goal, and while niche at the time, the sounds of these machines have become timeless, not for their similarity to orchestral instruments but for their place in our collective memory and nostalgia. 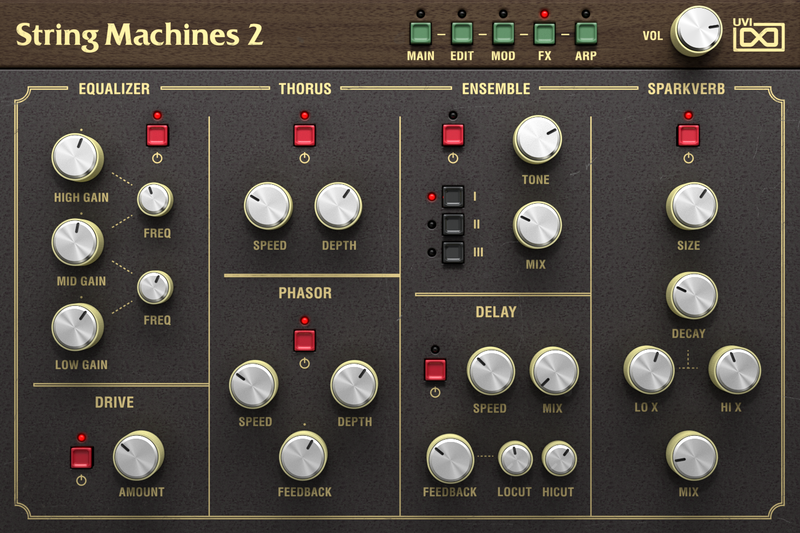 Today these synths are mostly gone, broken with age and discarded, the threat of many of them disappearing completely becoming a reality. 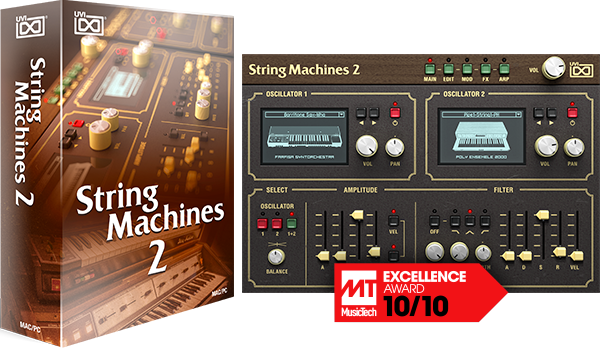 6 years ago we released String Machines, which captured 11 of the most iconic of these synths. Now we're back and we've added 51 more machines to the list. 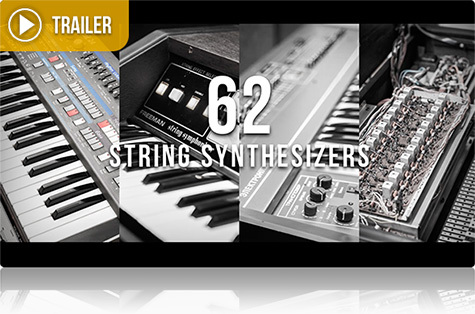 Explore classics like the Solina, Freemand String Symphonizer and Elka Rhapsody as well as extremely rare models including the Yamaha SK-50D, Logan Vocalist, Jen SM2007 and more. Many of these machines were very hard to track down and most of them came to us in non-working condition, needing to undergo serious repair and restoration. 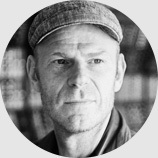 The result was well worth the effort, as String Machines 2 has grown into both an important archive and an inspiring instrument. 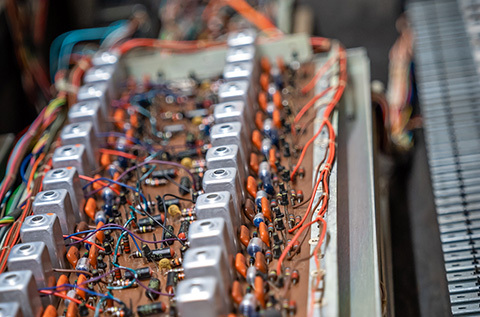 Each of these old string synths was meticulously inspected, tested and calibrated to ensure as close to factory functionality as possible. 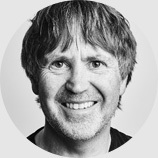 After spending time with each machine to identify signature sounds, unique qualities and natural strengths, our sound designers captured them in the highest-quality possible with premium DI boxes, hardware processors and converters. 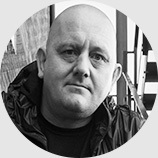 Each sample was hand-trimmed and processed to bring out the best sound with a mastered finish. A diverse assembly of instruments, some made decades and continents apart, the sound of String Machines 2 is vivid and soulful, rich with the subtle character and quirks of aged components. String Machines 2 is designed with two discrete layers so that you can easily choose from and stack any of the 842 included synthesizer sounds. Having been originally designed to emulate acoustic strings, the sound of these machines often layer and modulate in very pleasing ways, naturally lending themselves to work in ensemble. 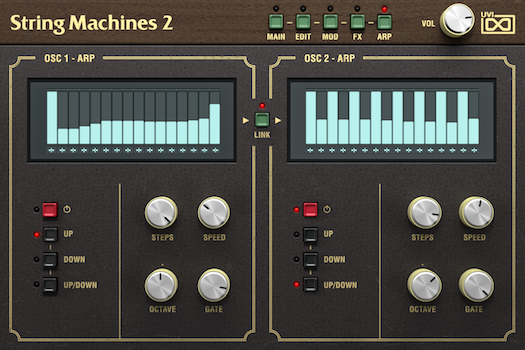 With String Machines 2 you have full control over amp ADSR, multi-mode filter, voicing, stereo, LFO and step modulators and arpeggiator for each machine, allowing you to modify presets or create new sounds from scratch in any way you like. 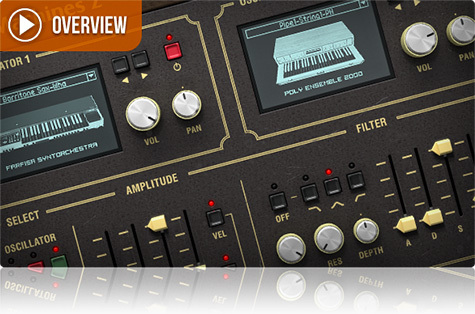 A capable effect bus adds the finishing touch, including EQ, Drive, Thorus, Phasor, Delay, Sparkverb and an authentic ensemble effect modeled after the Roland RS-505. 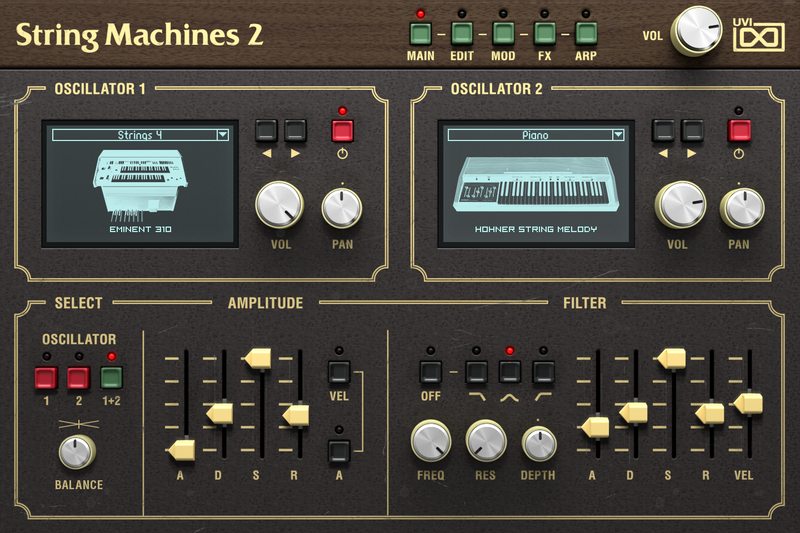 With the authentic sound of 62 string synthesizers, String Machines 2 is a sonic archive reinvigorating these warm, charactered timbres in a singular creative instrument. All sounds in String Machines 2 are original creations of the UVI sound design team.